As the West warms, some songbirds in California are raising their young earlier. For the humans, breakfast meant waking up an hour before dawn in a tent and grabbing something quick — generally a granola bar that had frozen overnight, recalls Morgan Tingley, an ornithologist at the University of Connecticut. Then he and the other researchers would hike through forests in California’s Sierra Nevadas, listening for the peeps and trills of birds stirring in the crepuscular light. As a graduate student in the mid-2000s, Tingley helped lead the Grinnell Resurvey Project, an effort to repeat the remarkably thorough biological inventories that Joseph Grinnell, the founding director of Berkeley’s Museum of Vertebrate Taxonomy, had orchestrated across California 100 years previously. “You’d write down every single bird you could detect, by sight or mostly by sound,” Tingley recalls. A house wren constructs its nest. Nesting is an especially vulnerable time for birds. “Bird nestlings are featherless, naked, need to be incubated — which is to say, they are basically coldblooded,” says Jacob Socolar, a postdoctoral research fellow at the University of Connecticut. “They are at the mercy of whatever temperatures they are experiencing.” Also essential for baby bird health is a high-protein diet, in the form of beetles, grasshoppers and worms, which harried parents stuff down endlessly gaping beaks. This means that baby birds are temperature sensitive in another way, too: They can’t thrive if it’s too hot for the insects that they eat to survive. Joseph Grinnell's field notes from May 26, 1911, when he and his wife Hilda ("Mrs. G.") spent the morning photographing a Calavera's Warbler nest in Yosemite. 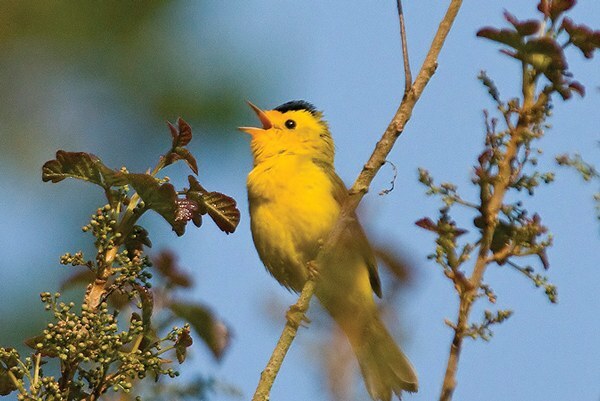 The Wilson’s warbler is one of the songbirds found in both the Sierra Nevada and Coast Range that is helping scientists understand how species respond to climate change. Socolar is quick to point out that this research is only one possible explanation for why some birds are not moving their nesting locations in response to climate change. Other possibilities haven’t been ruled out yet, he says — maybe some California birds can tolerate wider temperature ranges than others, for example. As temperatures continue to rise, the future of many of California’s songbirds may depend on that answer. Maya L. Kapoor is an associate editor for High Country News.